The Rack and Pinion is an adjustment mechanism that allows the user to move one part, close to another part, in a controlled fashion. 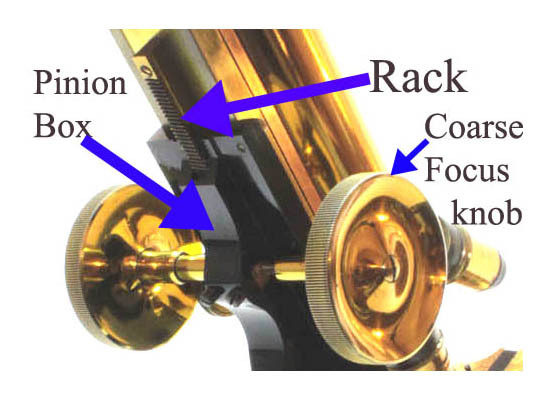 The most common use is for the coarse focus mechanism of a microscope. It has also been used to focus the substage, and occasionally is found with a circular rack to rotate a circular stage, and sometimes for other uses. In use, the pinion is turned by a knob attached to its axle. The pinion teeth mesh with the rack teeth, and, usually, as the pinion is turned, the rack moves. The pinion is usually enclosed in a pinion box which holds the pinion with the proper tension against the rack. On good quality microscopes, this tension is adjustable. 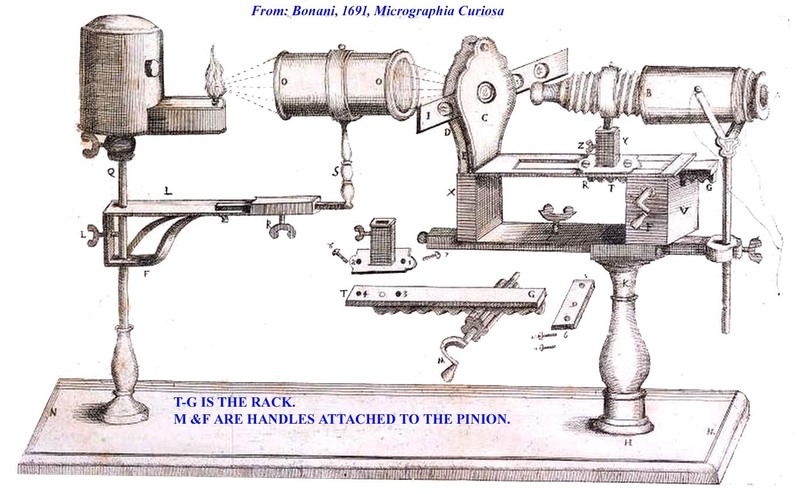 The first microscope known to be equipped with a rack and pinion adjustment mechanism, was illustrated by the Italian Bonani in his 1691 book Micrographia Curiosa (left). The mechanism was ahead of its time, and was only slowly adapted by other makers. The mechanism started to become popular in the eighteenth century, used by makers such as Benjamin Martin. Martin only used this on his most expensive microscopes. The mechanism became more popular in the early nineteenth century and has been in common use for this purpose ever since. At first the spacing of the teeth was rather coarse, but as time went on they became finer. One of the problems encountered by these devices was a degree of backlash after focusing. 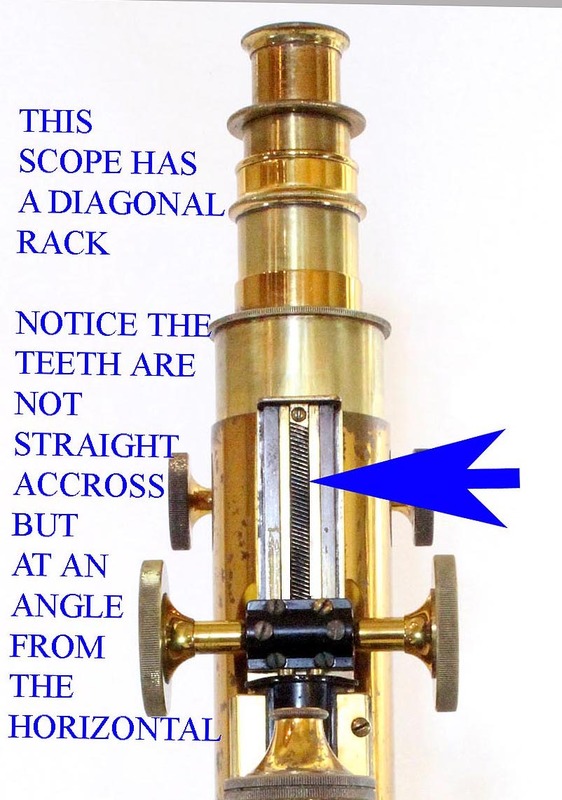 This occurred because of the variation in the degree of contact of the pinion teeth as the pinion was turned; the weight of the microscope tube tended to cause the movement to move back into a position of contact. This tendency could be partly counteracted by increasing the tension on the pinion, but also made it more difficult to turn the focusing knob. It was not until 1881 that this problem was rectified via an invention by James Swift. In 1881 James Swift's company was the first to introduce an improved form of rack and pinion wherein the teeth of the rack were diagonal instead of horizontal, and the pinion, to match this, also had diagonal teeth rather than straight horizontal ones. This allowed a consistent degree of contact of the teeth of the pinion with those of the rack and greatly reduced backlash, increasing accuracy of coarse focusing. Although introduced in England in 1881, and quickly adopted by most English makers, the introduction of this improvement in America was substantially later, certainly no earlier than the 1890's.